“Ahead, the railroad tracks and small grocery store right beside them let me know that we were about to cross into what most folks around Birdsong refer to as The Other Side. I come here now and then with Mama when she drops off a lady named Mrs. Masters, who helps her with spring cleaning and serves when we have Christmas parties. Mostly colored people live here, and that includes, according to Mrs. Masters, five families of Gullah-Geechees who somehow made their way here from the Carolina Sea Islands and speak their own language. Patrick and I strolled through The Other Side and passed a Baptist church and the colored school, which is actually just a small house. Once, just a couple of weeks earlier, when I had to bring five dollars to Mrs. Masters that Mama owed her, curiosity kept poking at me until it finally forced me to peek through the windows. A single room with a blackboard and a few rows of desks was all I saw. Right then, I’d wondered why my school has so many classrooms plus a library and a playground and a cafeteria too, when all the colored kids have is this one room. And that night after supper, I’d asked Mama and Daddy about it. ‘Things are not always fair to colored folks,’ Daddy had told me. 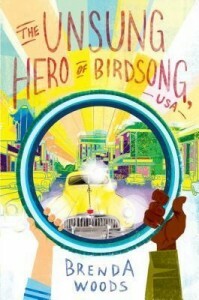 In the summer of 1946, in a small town outside of Charleston, South Carolina, twelve year-old Gabriel Haberlin doesn’t need to look any further than his dad’s combination gas station-auto repair shop-auto sales lot for a prime example of someone needing to think they’re better than other folks strictly because of the color of their skin. Lucas Shaw is an expert mechanic but a thoroughly despicable human being with reputed Klan ties. This becomes an issue for Gabriel after Meriwether Hunter, an African American mechanic who’s out of work, saves Gabriel’s life. In thanks, Gabriel persuades his father to give Mr. Hunter a job. A white businessman giving a black person a quality job in that time and place might seem a bit far-fetched, but Gabriel’s parents met while attending Oberlin College in Ohio, so we can understand how their views might be well out of sync with 1940s South Carolina. Lucas Shaw makes his feelings about Meriwether visibly clear from the beginning. Gabriel’s dad wisely sets the schedule so that Meriwether doesn’t start work until three in the afternoon, which is Lucas’s quitting time. But there’s still occasional overlap, and Lucas is nursing so many grudges and so much prejudice that we expect him to explode at any moment. What makes Meriwether Hunter the unsung hero of the book’s title is that he keeps it under wraps that he served bravely in a segregated Black tank unit in WWII. That was when he became such a crackerjack mechanic. But, as we learn, black war heroes didn’t get the public acclaim that white war heroes did. Instead, they were often targeted by racists. Meriwether’s service in the war is one of several contrasts between him and Lucas, who was repeatedly rejected by the military. Lucas’s wife has left him; Meriwether has a happy marriage and a sharp ten year-old daughter. Lucas is slovenly, smelly, and unfriendly; Meriwether is meticulous and personable. Meriwether teaches Gabriel that friendship isn’t limited to one’s own age group. It has to do with liking, trust, and respect. Since this is the Deep South in the 1940s, we expect something awful to happen to Meriwether Hunter. Even young Gabriel fears this from the start. We wonder whether he be able to help save his new friend from whatever may befall him. Given Gabriel’s vantage point, the story provides a powerful look at racism. THE UNSUNG HERO OF BIRDSONG also provides a needed history lesson about black war heroes who have served their country with pride and courage despite the country repeatedly and thoroughly failing them.